When scare tactics and manufactured myths create income, it raises questions on veterinary research, provides stunning answers on grape poisoning (and the Poison Control hotline). 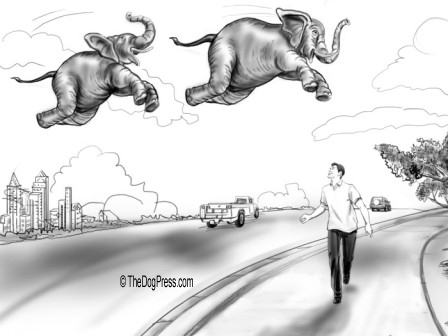 IT STARTED WITH ASPCA POISON CONTROL, AN URBAN LEGEND? 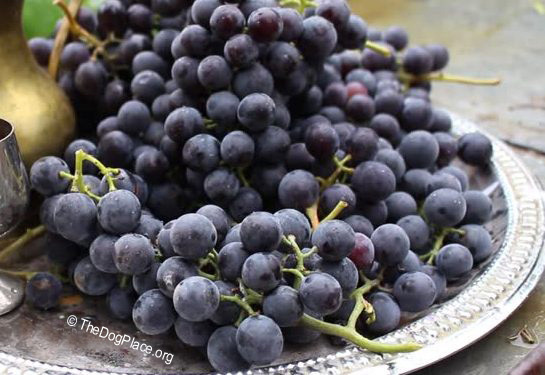 Snopes and ASPCA Poison Control say grapes are deadly to dogs but our breeder survey unequivocally refutes that. Poisoning is much more likely to be from medication or chemicals (including pesticides) than from food sold for human consumption but animal poison control suggests otherwise. Animal poison control lists raisin-grape poisoning symptoms as vomiting, diarrhea, depression, lethargy, anorexia, colic, dehydration and renal failure (death) if untreated. Absolutely seek veterinary help if your pet shows more than two of those symptoms. If your vet is closed, among the best phone numbers to call in an emergency is 1-800-222-1222 the National Poison Control Center which will automatically connect to their free service in your state. Depending on who answers, you may get quick, basic information for animal poisoning and it is free, 24-7. 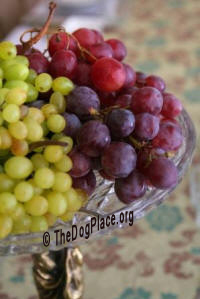 TheDogPlace.org was chastised for including grapes on a list of fruits and veggies dogs appreciate. Indignant emails referred us to the "deadly grapes" warning on Snopes which refers people to the Poison Control Center. We would have left it at that but there is more you need to know about the toxicity reports associated with grapes and raisins. First the facts behind a carefully crafted “urban legend” and then a little background on the ASPCA’s Animal Poison Control Center. We were unable to find any veterinary university study on the alleged deadly effects of raisins or grapes. That was suspicious, given the internet hype over poisonous raisins and grapes. If something so common can so easily kill so many dogs, why would the vet schools not research it? Surely an enterprising veterinary student would do a thesis on something so deadly and so easily documented? It was then brought to our attention that there is no profit in prevention and no prescription or antidote to raisin-grape poisoning. Well, that explains that! It doesn’t explain how the urban legend began or why it hasn’t been debunked until now. First though, a quick but clarifying background story. Snopes is the brainchild of a couple who saw the need for debunking Urban Legends just as we see the need to enlighten pet owners. So we checked Snopes as the oft-cited source for the "deadly grapes" stories but found only a veterinarian's personal assessment, a brief dissertation written by someone with no veterinary credentials, and interestingly, numerous references back to APCC (Animal Poison Control Center) which is apparently owned by the ASPCA. Still grasping at straws, Snopes still fails to mention any university studies which is the first thing researchers look for in determining the validity of a medical report. Absent confirming grape-raisin-poisoning autopsies or a single definitive study, diagnosis could only have been based on hearsay or a panicky owner’s recollection that, yes, it seemed like the dog might have eaten raisins or grapes. We are also aware that a careless owner, realizing they failed to prevent the pet’s access to prescription medication, pest control or other toxic substances, would grasp any possible scenario rather than face self-recrimination. Onions As Poisonous As Grapes? Someone named Barbara "killing them with kindness" Mickelson, writing for Snopes, says "chocolate and cocoa can (also) prove deadly to them (dogs) as can onions and macadamia nuts." Onions? Every breeder I know adds onions to dog stew just as I've done for over fifty years. Maybe cooking makes onions safe? On the other hand, I can't imagine a dog eating a raw onion so I reject Ms. Mickelson's assertion. I've never shared macadamia nuts with my dogs but they love peanuts, pecans and my Waldorf salad containing walnuts. 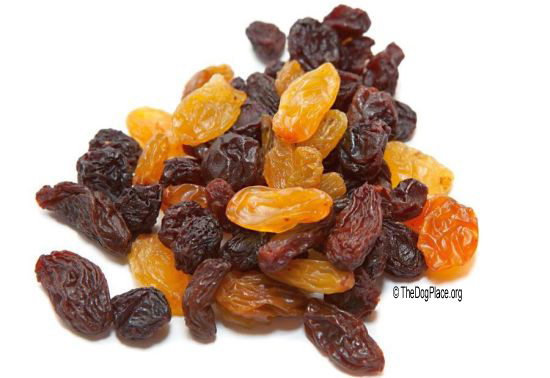 In any case, assuming that raisins would be more toxic than grapes due to the sulphur dioxide and other chemicals used in the curing process, we might believe the veterinarian is correct in stating a dog that actually “ate half a canister of raisins” (or prunes, figs, dates, beef jerky, etc) could be poisoned. On that basis, we surveyed dog breeders, veterinarians, and professional handlers across the nation. We asked if they, or anyone they knew, had experienced a case of raisin or grape toxicity. We expected at least one confirming reply. After all, millions of dog owners use grapes as treats and according to the “GRAPE ALERTS” now circulating the internet, ingesting even one grape can cause renal failure and death! The results were absolutely conclusive. 130 people responded but 0, not one person, has ever had or known of a dog that did more than wag and beg for more grapes! No disrespect to the ASPCA poison control database but the NetPlaces Network research is based on hundreds of years of professional dog owner experience. Additionally, this article will be read by a half million people over the next three months. 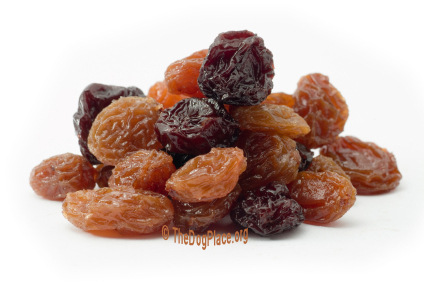 We request anyone who has raisin-grape study information or first-hand experience click link at end of this article and we will add that to a follow-up report. Contrasted to dogs that have died from ii Anti-freeze Poisoning, we must conclude that the ASPCA poison control database is incorrect and misleading. So why would poison control perpetuate an "urban legend", especially one that seems to have been deliberately created in order to profit a private enterprise? Conflict Of Interest: Snopes and ASPCA Poison Control? The ASPCA owns the Animal Poison Control Center. In 1996 the ASPCA acquired the Animal Poison Control Center (APCC) call center. The APCC is an income-producing business. We do not imply that Snopes, APCC or ASPCA would generate a story for any form of quid pro quo, only that it is a serious lapse in disclosure. It should also be noted that, in addition to the Animal Poison Control Center, which charges callers a $60 fee , ASPCA has another enterprise; ASPCA’s Animal Product Safety Service (APSS) for pet product makers. Equally interesting, TheDogPress.com stated "Dog food and other pet foods continue to make pets sick, yet ASPCA’s Animal Poison Control Center concludes pet food recalls are “likely not food-related.” That perked up dog owner's ears and the news spread across the internet. The Animal Poison Control Center press releases come at a time when dog owners should be worried about Counterfeit Pet Food(1), recycled Toxic Pet Foods(2), and the biggest Pet Food Scandal of 2009(3) which is not grapes or raisins! 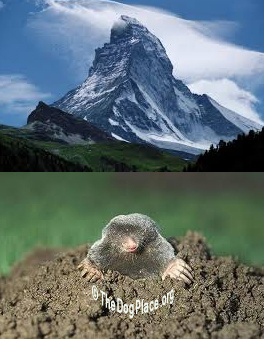 The "killer grapes" Urban Legend is like a mountain covering a molehill. The absence of medical evidence on raisin or grape toxicity and the inability to define what the toxic substance in grapes actually is causes owners to be distrustful of real warnings. That is a terrible disservice. Pesticide Problem Not Mentioned in Grape Toxicity Report! When an APCC veterinarian states that grapes caused the dog to become ill even though "no one knows" why, it demands an answer - from Animal Poison Control! Even more worrisome, the ASPCA Poison Control directly contradicts the flood of warnings from NIH (National Institute of Health), the FDA (Food and Drug Administration) and medical universities which stress washing all fruits and vegetables due to "high pesticide contamination." The Environmental Working Group (EWG), a non-profit research and advocacy group, issued a report in which the pesticide toxicity of fruits and vegetables was ranked according to FDA data. Imported grapes were the 10th most toxic fruit with domestic grapes ranking 21st on the list of 43,000 samples! Therefore, when the ASPCA - APCC states that no traces of pesticides could be found on grapes, it destroys Animal Poison Control Center credibility(4). In fact, it is reminiscent of the ii 20/20 Report in which John Stossel asserted that neither organic nor conventional produce samples contained any pesticide residue. Someone had given him a prepared script and our friend Stossel had to apologize. A reasonable person would assume that dogs suffering from classic symptoms of chemical poisoning were poisoned by the chemicals sprayed on the grapes rather than the fruit itself. Pet owners who check with Animal Poison Control might well be given information that could jeopardize diagnosis and thus, the dog's life. A veterinarian working under duress with a dog in critical condition needs instant recall or computerized facts, not misleading information. The emergency treatment for grape poisoning might be the same as for any form of chemical poisoning BUT misdiagnosis explains why dogs can be reported as having died from grape or raisin poisoning when it fact, the veterinarian made an incorrect assumption. Misdiagnosis usually leads to improper treatment. Given that no component of the grape has ever been identified as toxic to dogs, (tannins have been eliminated) it is grievously misleading to blame renal failure on grapes rather than toxic sprays, pesticides, or the lethal chemicals used to ripen fruit. Grapes are often imported from Chile where it is legal to fumigate with methyl bromide to kill bugs and fungi. Now you know why you are advised to wash all grapes before eating. When grapes are dried and treated to make raisins, the chemicals become even more concentrated. We warn against giving your dog raisins and indeed, dogs are not keen about raisins. In human medicine, failure to retract what appears to be profit-driven misinformation would shout “cover-up” and call for an investigation. Why has that demand not come from veterinarians? 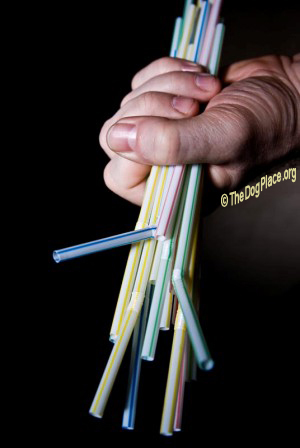 Only TheDogPlace.org dares speak out for the dogs? Side note: after this information was published June 2009, some veterinary websites actually doubled-down on protecting their income and incredibly, ASPCA Animal Poison Control said nearly all dogs that eat "even a single serving" develop renal failure. 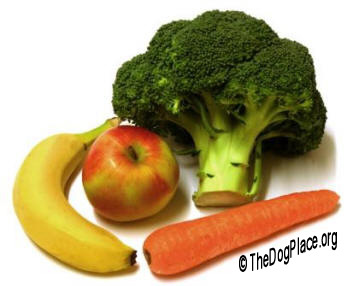 Dog require digestive enzymes, here's where they get them. Recalls continue but ASPCA's APSS denies food-related problems. Dogs are 10,000 times more likely to die in surgery than by "Killer Grapes"